Calgary is blessed with almost 1,000 km of pathways (one of the world’s largest urban pathways) used by pedestrians, runners and cyclists year-round. One of the key elements of the pathways system are it's pedestrian bridges which range from “plain jane” functional bridges to multi-million dollar iconic bridges designed by world renowned architects. 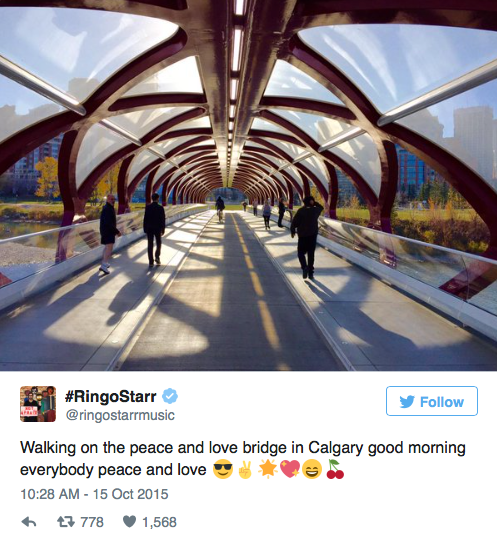 The main pedestrian bridge crossing the north side of the bow river into downtown is the World Famous Peace Bridge which just recently celebrated it's 5 year Anniversary. The Peace bridge remains a big attraction for visitors to our city. Calatrava’s Peace Bridge is unique in that it is doesn't incorporate his signature asymmetric monochromatic white forms with anchored high masts and cables. Calatrava's Chords Bridge for pedestrians and trains in Jerusalem. The candy cane red Peace Bridge name references the fact the bridge’s north side is on Memorial Drive, a boulevard that pays homage to Canada’s war and peacekeeping efforts over the past 100+ years. At the same time as the bridge was being built, Memorial Drive received a major makeover, creating a much more ceremonial street complete with the new Poppy Plaza, public art and ornamental lighting and decorative boulevard. The bridge was steeped in controversy from day one for several reasons. The cost ($20M+ was deemed too high by many for a pedestrian/cycling bridge). Why was it sole sourced? Why no pubic engagement? Was it even needed? And then there were the delays. An independent inspection company was engaged to inspect all of the welds completed in Spain. Red flags were raised about the aesthetics and safety of the welds, which resulted in all the welds being ground down and redone on site. The bridge sat on the riverbank for months - covered in orange tarps like some Christo artwork - while welders redid all of the welds. Funding for the Peace Bridge was provided through the City of Calgary’s Transportation Infrastructure Investment Program (TIIP), which defines the priority and timing of major infrastructure construction projects. One of the key elements of this program is to foster more pedestrian and cycling opportunities in high-density areas where these modes are more efficient at moving people, supporting land use and lessening environmental impacts. The final costs were $19.8M for construction, $3.45M for architectural and structural design and specialized and $1.25M in administration, quality assurance and insurance for a total of #24.5M.The Peace Bridge is 126 meters long and 6 meters wide, making it twice as wide as a normal pedestrian bridge, allowing separate pedestrian and cycling lanes (not that you would know it as pedestrians walk wherever they want). It is well lit to promote nighttime use. The bridge originally to be opened in fall of 2010 didn’t open until March 2012. The Peace Bridge is a popular place for a noon hour stroll or workout - it is an outdoor gym. The skeleton-like structure creates interesting viewing vistas for those who stop, while at the same time blocking an expansive view of the river, the sky, park and skyline as you proceed along the bridge. Visually it seems antagonistic, rather than synergistic with the natural setting. Peace Bridge links the north and south side of the extensive Bow River pathways system for walkers, joggers and cyclists. It is like an impromptu parade at noon hour in the summer, which creates a wonderful urban vitality. The bridge has gained attention by many, some for its design, and others for its cost. In 2012 the bridge was nominated for a Canadian Taxpayer “Teddy Waste Award,” but ultimately lost to a video of Montreal snow clearing crews who were busy scraping invisible snow off of bare pavement. As for real awards, it has garnered two: 2014 National Steel Design Award of Excellence and the 2013 Steel Design Award of Excellence. It's also had attention in the architectural world with a third-place nod from AZURE magazine, and designboom named it as number six in the world for top public spaces of 2012.